Saturday last week I started the day excited about the food writing & photography workshop I was to attend at Serye Restaurant at the Quezon Memorial Circle. I had never been to Serye before. I’d passed this branch a dozen times on morning jogs and noticed that they were open for breakfast, but had never tried it. Well here was my chance. That morning though I was more excited about the learning than the eating. Organizer Jayvee Fernandez had told us to bring blindfolds…the day promised to be interesting. As soon as I walked in I found the place very inviting. Inexplicably I was reminded of my lola, even though I couldn’t honestly picture her in a café. The place had the appeal of the familiar, and the warm-cozy atmosphere of a bistro-café. As I spoke with the very friendly staff the cake selection beckoned but I resisted. First, to business. Introductions first. I was amazed that lecturer Christine Nunag had actually taken the time to read each and everyone’s blogs, and remembered little details about all of us, including little personal details we’d each put in our profiles. This put me at ease real quick. What followed was a very informative, often funny but always thought-provoking exchange of ideas on viral marketing, food writing in the traditional media & parallels with the (relatively) new blog medium, the blogger’s responsibility to moderate reader comments, the late, great Doreen Fernandez, strange food stories, developing one’s observation skills, and sharpening one’s senses. At first whiff I knew it was pork. At the first crunchy nibble I knew it was sisig. 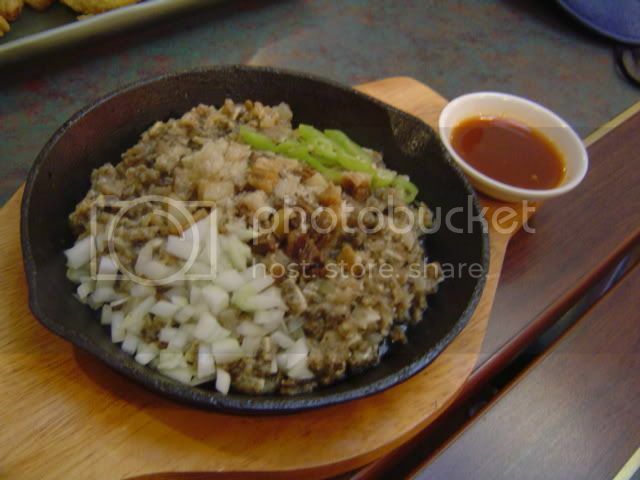 Unfortunately it wasn’t sizzling anymore (a small timing problem; the food had been ready some time before the discussion ended) but amazingly the sisig retained its crunch. It wasn’t drenched in oil, as some places serve it, but had just enough of the pork fat to give it a nice buttery mouth-feel & flavor. At the reveal I found that it came with a special sauce which I’d missed at the tasting. 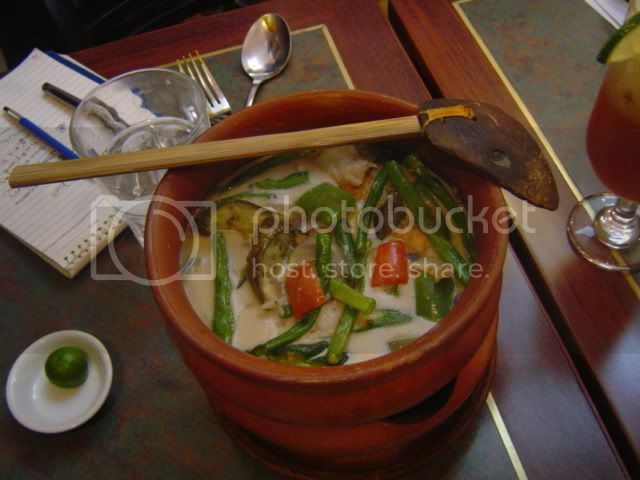 The sinigang broth had moderate sourness, nice body, and thankfully no detectable gabi hehehe. The bangus was firm, and the vegetables were pleasantly crunchy. I think I would’ve liked a fattier cut of bangus, and more bite to the broth, but ah that’s just me. This dish was nice and familiar, and I settled more comfortably in my chair afterwards. The first morsel of meat told me this was barbecued chicken. It was tender, had perfect caramelization, and went well with the smooth, peanuty sauce. I thought to myself, “Hmmm..tastes like the famous chicken barbecue from Aristocrat.” I was spot on, as it turned out. We were to discover later that our host Miña & her co-owners/siblings were of the 4th generation of the Reyes family of the Aristocrat Restaurant. The name Serye was in fact an anagram of their family name. By this time there was joking and chatting all around, especially as Chris Haravata started shooting pictures blindfolded. My mouth could tell there were two kinds of noodles in this, a great play on texture. Flavor texture and further tactile surprises were delivered by the crunchy sitsaro & carrot, shrimp, sliced kikiam, and a hint of chives & a sprinkling of sesame oil. At the reveal we found the color palette was just as lively as the dish was on the palate. With this dish the familiar ended. More accurately, it became harder to pin down. At first whiff I identified coconut milk. As I went through the dish though the flavor profile was at once familiar and elusive. Was there meat in it? Is that langka ginataan Bicol style? I was pleasantly bewildered. 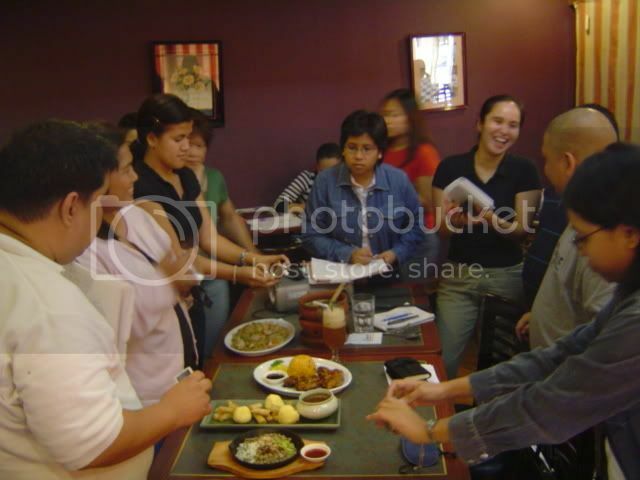 At the reveal Mina explained that Serye Express was a marriage of pinakbet and bicol express. Genius! Despite the playful juxstaposition this dish had coherence. 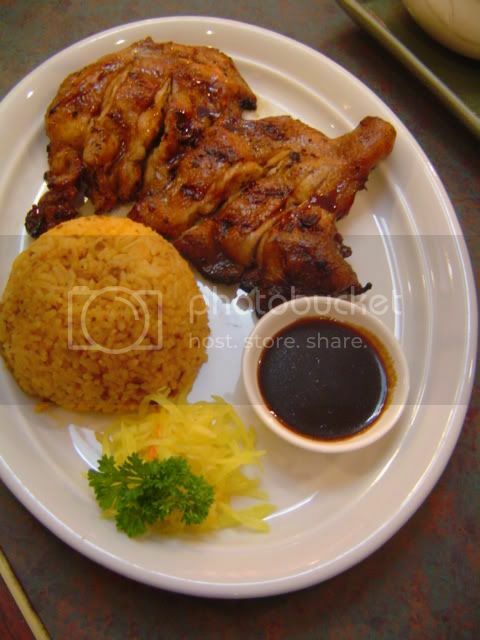 Attractively served in a traditional palayok, it was at once a group favorite. Back to tradition with this dish. I have never been big on kare-kare, except when it is impeccably executed, and this was one such occasion. Missed at the tasting: steamed rice & bagoong alamang. First I got the foamy head in my nose. Then I discovered the drinking straw. This was a refreshing draught. Real tea and real citrus. We all slurped it down to the last drop. 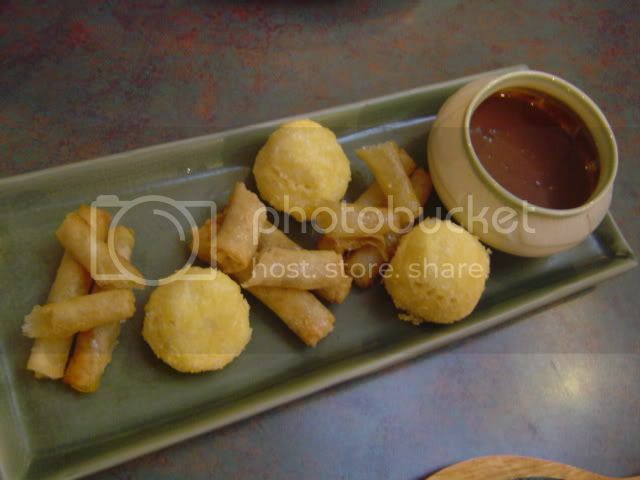 The last item was several pieces of miniature turon, but each piece seemed to have a different filling. Langka, saging na saba, sago. There was a small piece of some sort of creamy soft bread which turned out at the reveal to be cute mini ensaymadas. The Filipino-style (er Spanish) chocolate was a great accent to each piece. It was easy to imagine Ibarra & Maria Clara enjoying this dessert. It seemed fitting that the minds behind this dessert were the new aristocracy of the restaurant business. The writing workshop officially over, we all gathered for lunch. Yes, more food! 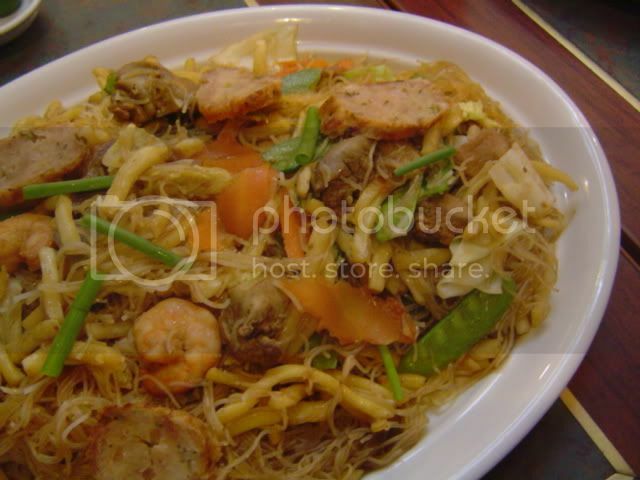 We enjoyed more of the great pancit, the barbecued chicken with java rice, Serye Express, the wonderful iced tea, and platters of Boneless Crispy Pata. Tender meat, crispy skin, and look, Ma, no bones! Awesome dish! I had promised my doctor I’d lay off the pork, but between pork day at chef school and this dish at Serye, I've surrendered! It’s sometimes supposed that bloggers are men and women of few words—shy types who speak little and need the written word, and the relative anonymity of the internet to find expression. Either that was untrue of this group, or merely because good food loosens tongues, or perhaps because the warm atmosphere & the solicitous Reyeses made us feel truly at home, but we were truly loquacious in between mouthfuls of crispy pata. Chris regaled us with his account of hunting wild boar and cooking it sinigang style in the wilds of Bataan, Betty talked about the horrors of traveling this far north, and I offered my thoughts on how the pata was deboned. Now I had a new reason to go to QC Memorial Circle. I kept wishing I hadn’t waited this long to try this resto out. The dishes are at once familiar, steeped in tradition, and new and playful. Similarly, Serye is a great place to bring family and old friends, and as I did that day, make new friends. Perhaps the name of the place has another meaning to it: you’ll want to keep coming back. More later: The photography workshop facilitated by Markku Seguerra & Jayveee Fernandez. Nice piece. I really have to learn to be more descriptive like you. (as advice by Christine). I would have enjoyed watching my friend Christine run her first workshop. Shame I couldn't sample the food because I'm pesco-vegetarian. Wyatt: I'm glad you liked the piece. Thanks! The workshop was fun, 'no? :-) Are you going to the Mrs. Fields event? Joy: Christine did a really good job! We really learned a lot from her. 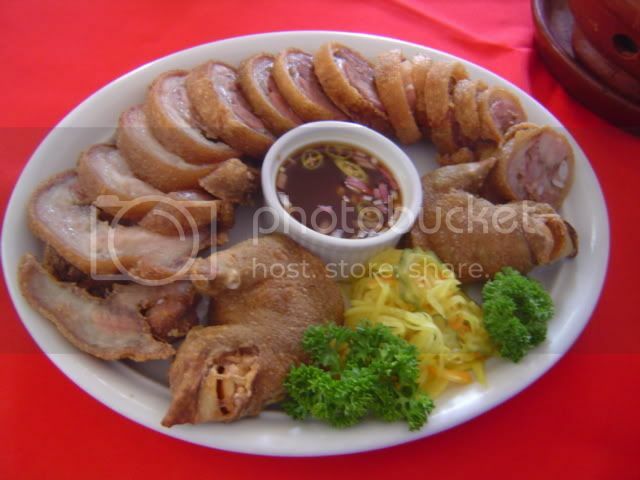 jb, thanks for the great info on the boneless crispy pata. you and chris are foodies through and through! joy, fancy meeting you here! You know I like to work with powertools, but I can cook, too. Don't worry, there's no superglue in that.